As you book the florist, pick the bridesmaid dresses and go cake tasting (that’s a task we would be happy to fulfil!) you might not be able to keep up with how many days there are until your special day! If so, we have the perfect craft that you will LOVE to update! This project would also make a wonderful gift for a bride to be in your life. The First Edition Floral Fusion papers are so delicate and will act as a wonderful background for this exciting countdown. Read Maxine’s tutorial to find out how easy it is to make this sweet home décor project. 1. Paint the MDF heart with the black chalkboard paint, leave to dry. 2. Paint the edge of the plaque with your Deco Art Chalky Finish- Pink Paint, allow to dry. 3. Cut your chosen First Edition Floral Fusion 12x12 paper down to fit the plaque and adhere to the plaque with Dovecraft Perma Fix Tape. 4. On the reverse side of the plaque use a pokey tool to make a hole through the paper. 5. Cut the Simply Creative White Glitter stickers out, leaving the backing in place. Place them onto the plaque in your chosen place, along with the MDF heart to see where you want them to be. 6. When you are happy with the placement, remove the backing and adhere the letters and glue down your MDF heart. Die cut the rings from the First Edition Wedding dies set onto Dovecraft White glitter card, glue down onto your MDF heart. 7. Thread a length of Dovecraft ribbon through the holes in the plaque for hanging, secure with two knots. 8. 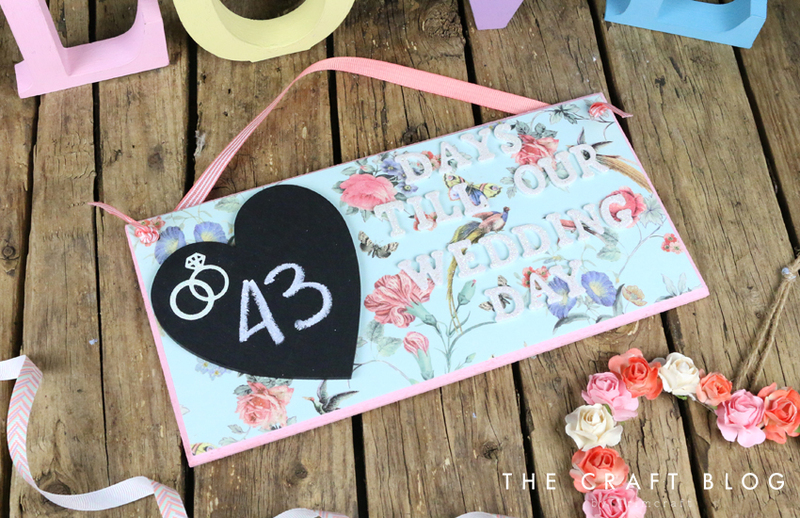 Use the Dovecraft Chalk Markers to write down the number of days till your wedding! You could also make an adorable plaque to count down to when you or a loved one’s baby is born with the Dovecraft Baby Steps collection! The buttons and ribbon really makes this plaque a lovely keepsake. Or if you are bubbling over with excitement for a beach holiday (because who doesn’t love to get their toes stuck into the sand?!) the First Edition Paradise Crush paper designs would be a brilliant choice for a countdown to your time in the sun! How will you use our countdown plaque design? We would LOVE to see, so don’t forget to share your makes in the Inspiration area and to #trimcraft when uploading to social media.